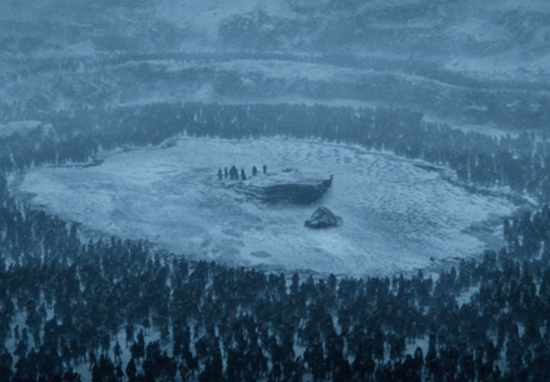 A jarring image has been circulating the internet and driving pedantic Game of Thrones fans insane. The still is taken from the tense, terrifying battle against the Wights in ‘Beyond the Wall’, and in the background is what appears to be a white pickup truck. Of course, it was an observant Redditor who brought this to the world’s attention, but they have since deleted their account. Now as we know, the good people of Westeros don’t tend to travel by truck. They prefer horses, dragons, and long moody hikes through the snow. Naturally this picture caused an outpouring of confusion. Has Bran been able to warg into a truck from the future and park it slam dunk in wight territory? Or, more likely, has the special effects team forgotten to erase the truck from the otherwise mesmerizing landscape? Actually, it’s neither of these things. This image never actually made it into the nail biting episode and is instead taken from behind the scenes footage where you can see the work which went into creating the atmospheric episode. The misunderstood footage shows the moment when one of Jon’s plucky companions falls to his death at the hands of the dead. The out of place vehicle was used to transport building equipment across Ireland, so an enormous frozen lake could be created from a concrete set.